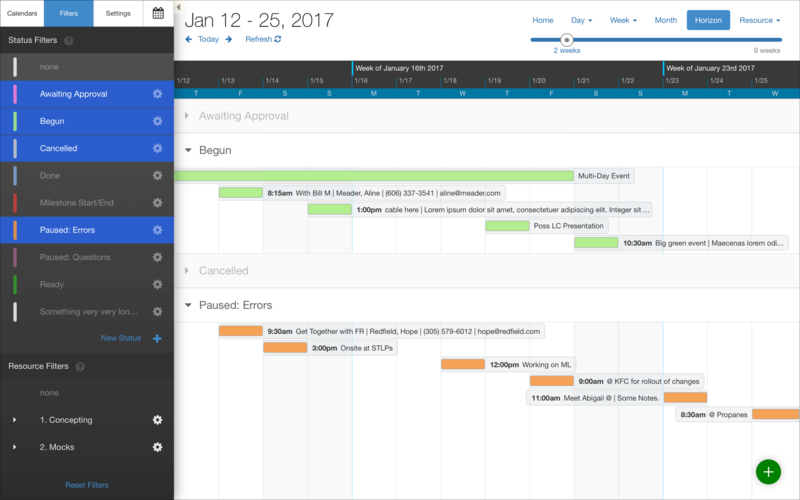 The look and feel ofDayBack is controlled through a CSS file which you can edit to alter the calendar's appearance and match the colors used in your own Salesforce deployment. How can I increase the font size for events so they are easier to read? Can I hide the red line for the current time? How can I remove the start time from displaying? Can I prevent the new event popover or plus button from showing? Can I remove the delete button from the event's popover? Can I remove the custom actions button/cog from the event's popover? That little handle for resizing an event makes small events look too crowded; can I get rid of that? Can we change the color/opacity of the new event highlight? Note: You can specify a color or enter an rgb attribute if desired. Opacity can be specified between 0 (invisible) and 1 (solid). Can we rotate the column headers on the Resources / Schedule view? Can I color alternate rows on the schedule views? Yes. 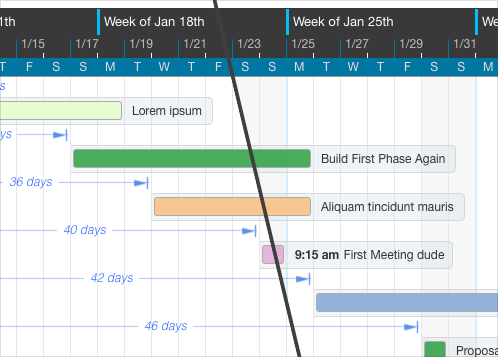 Add this to get alternate-row scheduling that makes the calendar look more like a spreadsheet. Can I hide one of the tabs in the sidebar, like "Filters"? Yes. I'm not sure you'll want to hide the settings tab as without it there is no way to get to the Account Settings section of the calendar, but if you'd already entered your license--and you remember how to undo what follows--maybe that's ok. Hiding the tabs is easy. Here's the code to hide Filters and Calendars, resizing Settings. How do I remove the green plus button and the ability to make new events? Can we change the color of the lines between days of the month or week? Can I make the button to show or hide the sidebar more obvious? Yes; the code below will move this button to the right of the date header, make it larger, and cause the "show sidebar" text to be visible all the time. The last two sections swap out the icon: you can use almost any of the font awesome icons shown here. Can I change the icons used throughout the calendar? Note: Watch out for smart quotes! Make sure the icon code is wrapped in straight quotes. Copy/paste these "quotes" if your keyboard just doesn't want to type them in. Can I make customizations to a specific view only? 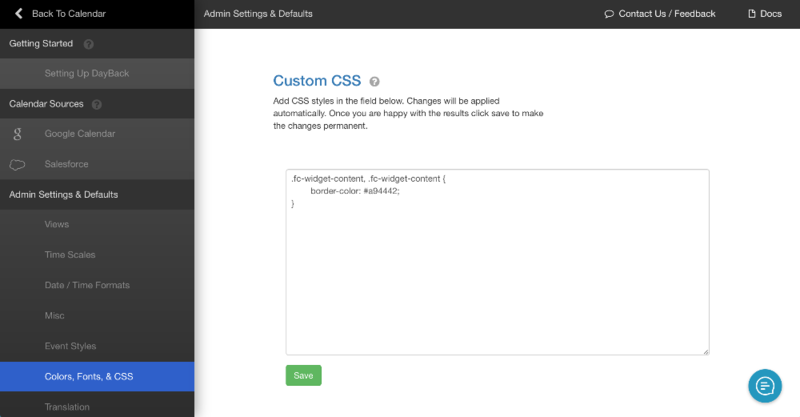 You can see an example of CSS applied specifically to the Horizon view in the following section. What about changing the popover for just one source/calendar? I'd like to shade weekends in Horizon view so it's easier to see where weeks start and stop? You might also like this mod, which adds a vertical line to the beginning of your week. Works great with the mod above. In your CSS, replace "mon" with your start day. Can I change the color of the "none" resource column? Yes! Using this technique you can assign a color to any resource column simply by replacing "none" with the name of that resource. Can I style the date numbers in the sidebar's mini-calendar? How can we remove the "New Status" button in the filters sidebar? Can I change the appearance of collapsed 'breakout' rows in Horizon view? Can I change the size of the label column in the Resource Pivot views? Can I change the “Selecting contacts is only available in Salesforce” message? Can I make a specific popover field read-only? Note: Since this only prevents mouse clicks, it works great for picklist items, like Resource, or Status, but users will still be able to use the Tab button to enter a text field. Can I increase the default heights of text fields in the popover? Sure thing. The different fields are listed below with their default heights. Increasing the height of title and/or description may cause a scroll bar to appear in the popover for overflow. If you'd like to avoid that popover scroll bar, you can increase the height of the whole popover as well. Be sure to adjust these two values by the same amount (although that amount may not exactly correlate to the adjustments made above). Can I color the background of specific dates like holidays? Yes, though you may want to consider creating appointments for holidays instead: appointments will show up on every calendar view (the CSS below only works on Month and Horizon view) and appointments can be created using DayBack's repeating events engine. But if you do want to style a specific date, here's how. How can I find the class names in DayBack? You can use the online version of DayBack to inspect the classes available to you. Here's a cool little video to show you how.